Sen. Elizabeth Warren (D., Mass.) said while speaking in Iowa on Sunday that President Donald Trump might not "even be a free person" next year. The freshly declared 2020 presidential candidate, who has largely avoided directly attacking Trump on the campaign trail, implied to a Cedar Rapids crowd that her potential Republican opponent may soon be imprisoned. "Here’s what bothers me," Warren said, according to reporters. "By the time we get to 2020, Donald Trump may not even be president. In fact, he may not even be a free person. But here’s how I see it. Donald Trump is not the only problem we’ve got." The remarks in some way mirrored Warren's fiery announcement speech on Saturday in Lawrence, Massachusetts, when she said fixing the issues facing the United States went far beyond beating Trump next November. "The man in the White House is not the cause of what is broken. He is just the latest and most extreme symptom of what has gone wrong in America," Warren said. "A product of a rigged system that props up the rich and powerful and kicks dirt on everyone else." "Once he's gone, we can't pretend that none of this ever happened," she added. "It won't be enough to just undo the terrible acts of this administration. We can't afford to just tinker around the edges, a tax credit here, a regulation there." Warren didn't mention Trump by name during first Iowa tour, but she hits him at the start of this one. "By the time we get to 2020, Donald Trump may not be president. In fact, he may not even be a free person." She will visit Lawrenceville, Georgia, for an organizing event on Saturday, the Atlanta Journal-Constitution reported. 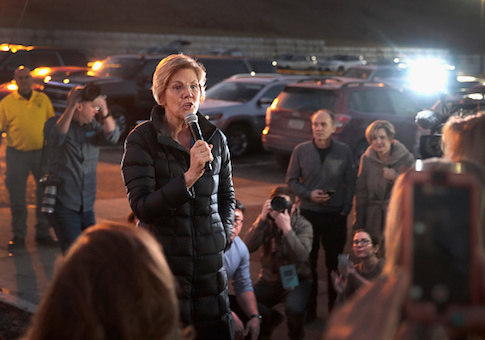 Trump mocked the nagging controversy over her claims of Native American ancestry on Saturday evening with a tweet wondering if she would run "as our first Native American presidential candidate."